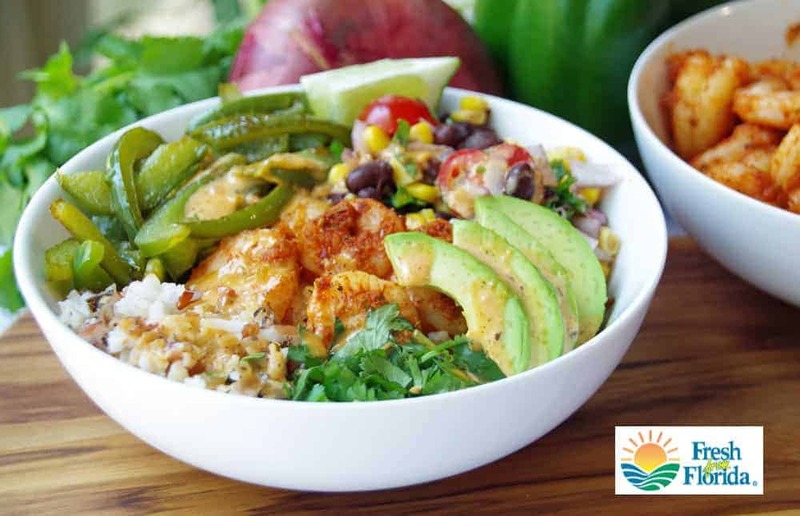 This Blackened Shrimp Bowl Recipe is sponsored by Fresh From Florida as part of an Influencer Activation for Influence Central. All opinions expressed are my own. Having grown up in New England, I know a thing or two about seafood. I pretty much grew up on clam chowder and baked cod. However, I REALLY learned to appreciate a good seafood dinner after I moved to Houston. Seafood went from mild to wild once I stepped foot in the south! 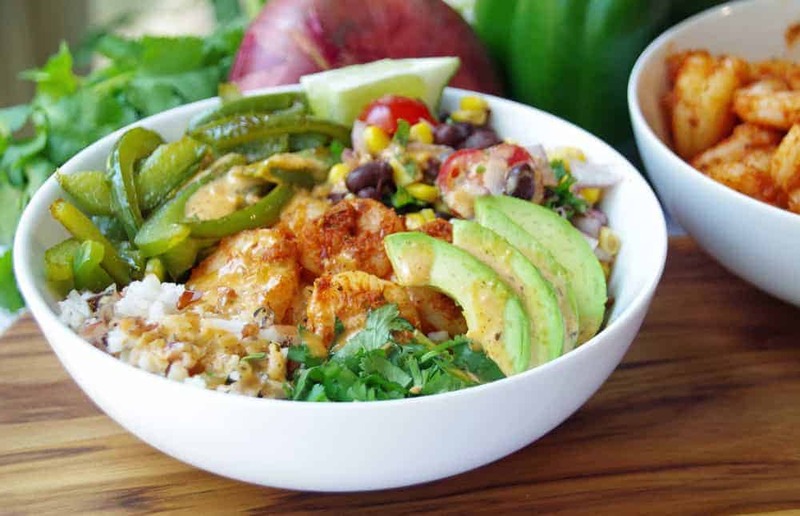 This blackened shrimp bowl recipe is loaded with flavor and is a delicious dinner recipe that is as pretty as it is tasty. Loaded with bell peppers, corn salsa, spicy shrimp, and rice, it is a filling seafood recipe that makes your taste buds happy! With bell peppers Fresh From Florida, I’ll be making a ton of rice bowls in the coming months! Bell peppers should be firm, and glossy. The skin of the bell pepper should be taut and unwrinkled. Look for peppers who’s stems are fresh and green. Bell peppers are best when they are thick-walled and juicy, so they should feel heavy for their size. 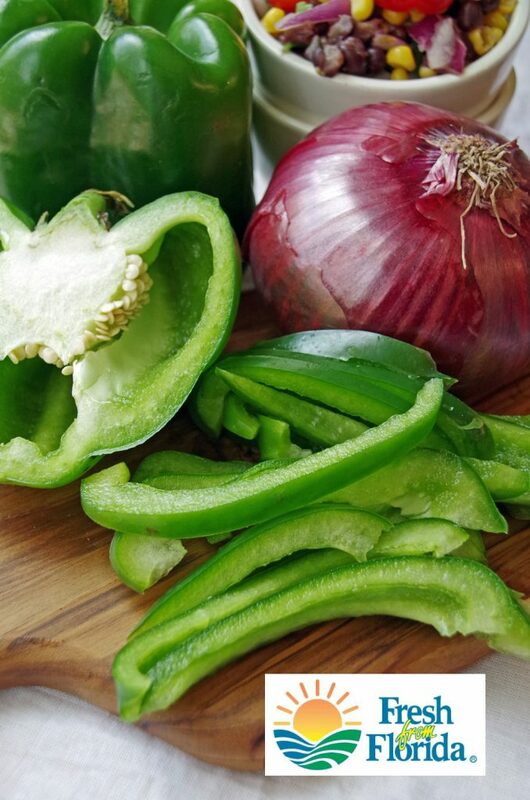 Avoid bell peppers with soft areas or black spots. Choose peppers grown in the USA for freshness. The Fresh From Florida label means they were picked fresh and grown with care! Fresh From Florida bell peppers, squash and sweet corn are in season in Florida! Get in the habit of looking to see where your produce comes from. Many large grocery stores are now highlighting where their produce comes from. This makes it easier for you to choose Florida produce, rather than fruits and vegetables that were grown overseas. Some Florida produce can even be found year round! Look for produce and seafood that is as local to you as possible when you shop. Check out the Fresh From Florida website for dinner inspiration. How Can You Tell if Shrimp Are Cooked? Cooking with shrimp can get a bit tricky. One second they are raw and the next they are so over cooked that they are rubbery. 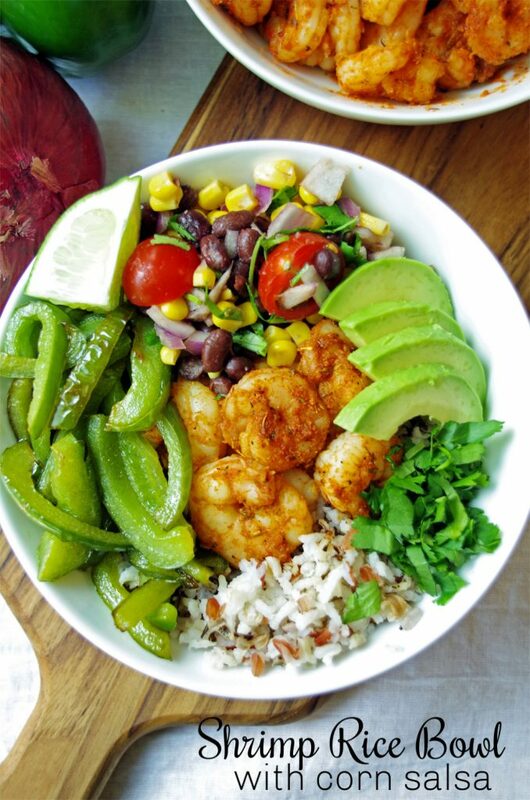 How do you cook shrimp to perfection for this blackened shrimp rice bowl? Cooking shrimp takes only seconds but don’t take your eyes off the pan! When shrimp is raw, the flesh is a sort of grayish color. As it cooks, they turn an opaque whitish pink color. This only takes about 2-3 minutes per side in a hot pan. When cooking shrimp, remove them from the pan when they form a loose ‘C’ shape. If they create a tight ‘O’ shape, they are already over cooked. An under cooked shrimp will still have bits of grey on it and form a flexible ‘U’ shape. Don’t under cook it but watch closely! When making this shrimp bowl recipe, cook the shrimp last. That will ensure that it doesn’t dry out before you serve your meal. Have everything else already chopped and ready before you toss the shrimp in the pan. It won’t take long to cook shrimp in a hot skillet! 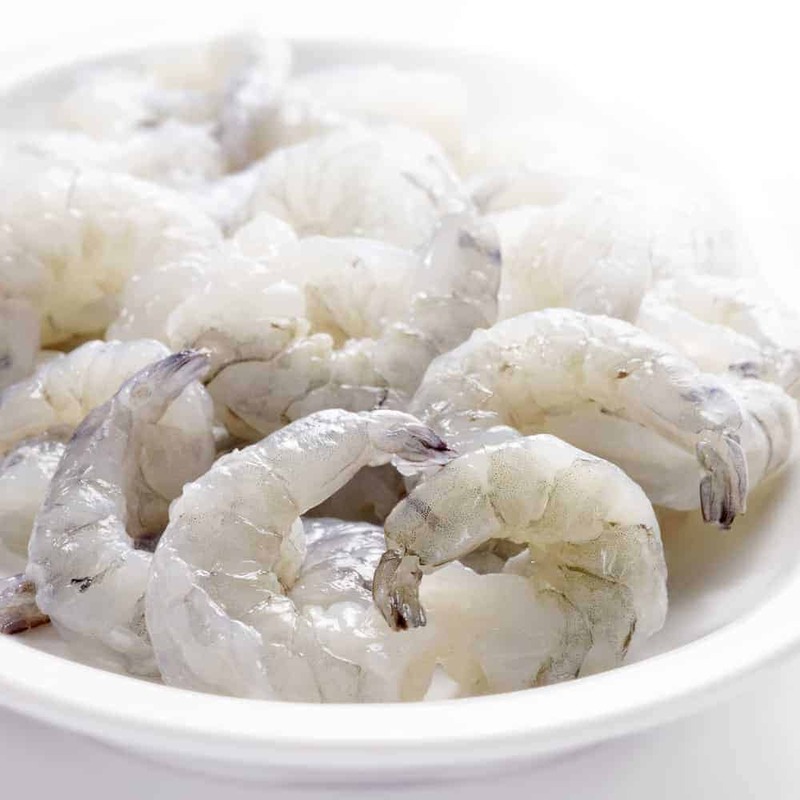 If you are using frozen shrimp, make sure to let it thaw completely before cooking. Building a rice bowl for dinner is incredibly easy. It is also very flexible so change up the meats, veggies, and flavors depending on your own preferences. But, for a basic rice bow recipe, start with rice (obviously!). Then add vegetables (you can use fresh, frozen or canned). Next, add in some protein. You can go with beans, eggs, chicken, fish or even tofu. 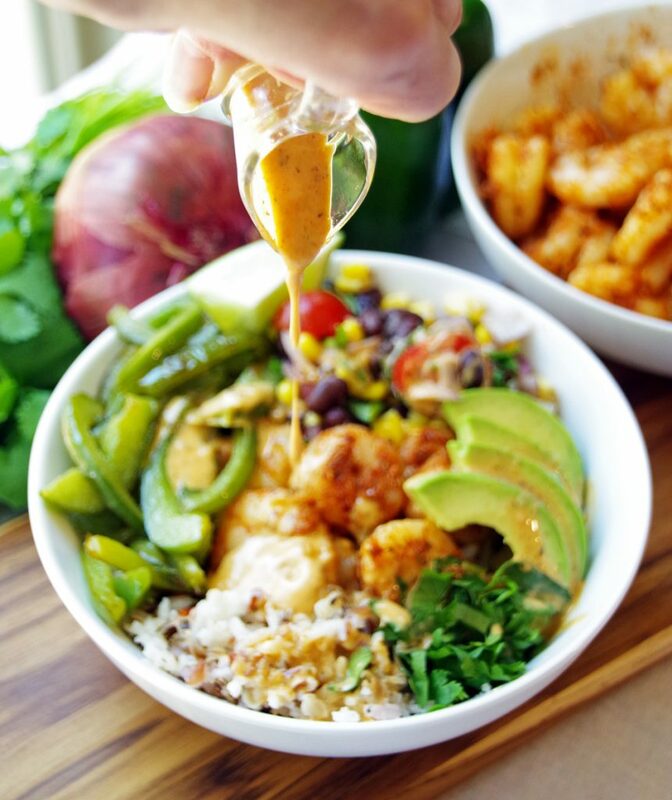 Top your rice bowl recipe with a sauce, toppings, spices, etc. Some examples are ranch salad dressing, lime juice, barbecue sauce, or feta cheese. See, rice bowls are incredibly versatile! 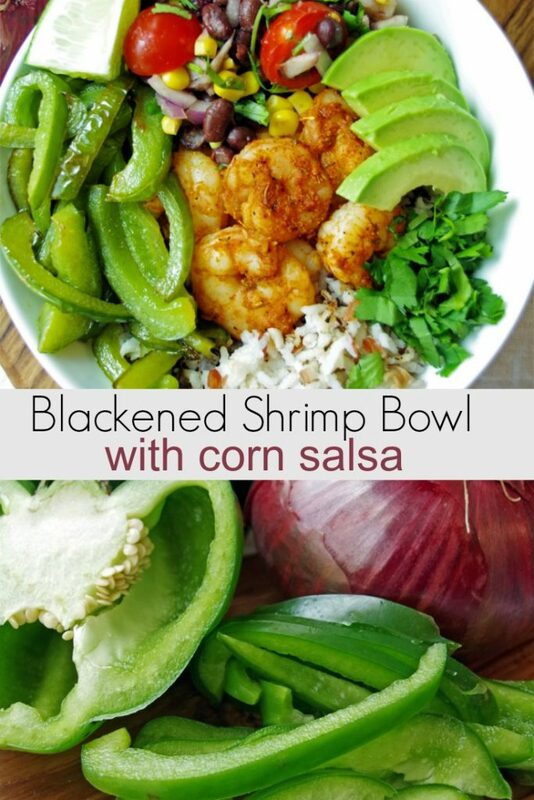 For this blackened shrimp bowl recipe, I went with spicy blacked shrimp, freshly sauteed bell peppers and onions, an easy corn salsa, and a drizzle of lime juice. It was a great blend of flavors that reminded me of a fajita with all the fixin’s (as they say down here in the south!) Of course, fajita RICE BOWLS are way less messy to eat than wrapped in a tortilla! I used a premade cajun remoulade thinned with lime juice and olive oil to drizzle on top. 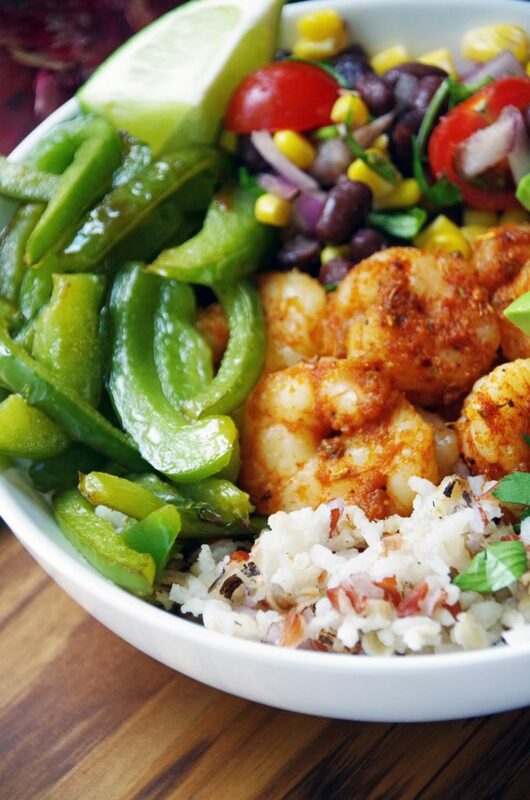 Loaded with bell peppers and onions, spicy shrimp, beans and rice, this shrimp bowl is a filling seafood recipe that makes your taste buds happy! Combine the corn, beans, chopped red onion, cilantro, and cherry tomatoes in a bowl. Sprinkle with garlic powder and squeeze the lime juice over it. Stir with spoon and let sit while you cook the rest of the ingredients. Heat 2 to 3 TBSP olive oil in a skillet over medium heat. Toss in thinly sliced bell peppers. Cook, stirring frequently, until they are slightly soft. Remove from pan. Toss thawed shrimp with blackened seasoning mix. Into the same pan as you used for the peppers, add the shrimp and cook 4 to 6 minutes or until done. Don't over cook. Add a cup or so of cooked rice to a wide, shallow bowl. Surround with piles of shrimp, bell peppers, sliced avocado, and corn salsa. Sprinkle with cilantro and additional lime juice if desired. Serve hot and enjoy!